as i was working. i have learn alot of stuff. be it in my work and of course handling the friendship among all the temp staff and everyone working there. there's one temp staff who told me that i'm like a spoilt child. i thought of it and it's so true. i'm being spoilt since i was young. i get everything i wanted since young. my family dote on me like hell. for my primary school days i've got a bunch of good friends around protecting me. the secondary school times. i have good friends in class and all my hella best friends were in band. they treat me damn well and nice. i have a bunch of blog fans who always read my blogs and giving me support. 'fingers'(my clique) is always there for me. they always give in to me and whatever i want to do they will agree. they'll go my way. until now in poly, my friends are still giving in to me and they're really nice to me. everything is too much of ME! working with some people can really pissed me off. but some, you'll look forward to work with them. that's so strange. all the perm staff and promoters there are really good to me. i mean all and so thanks! some pictures we took! i edited the pictures as the quailty of it is not really that good. 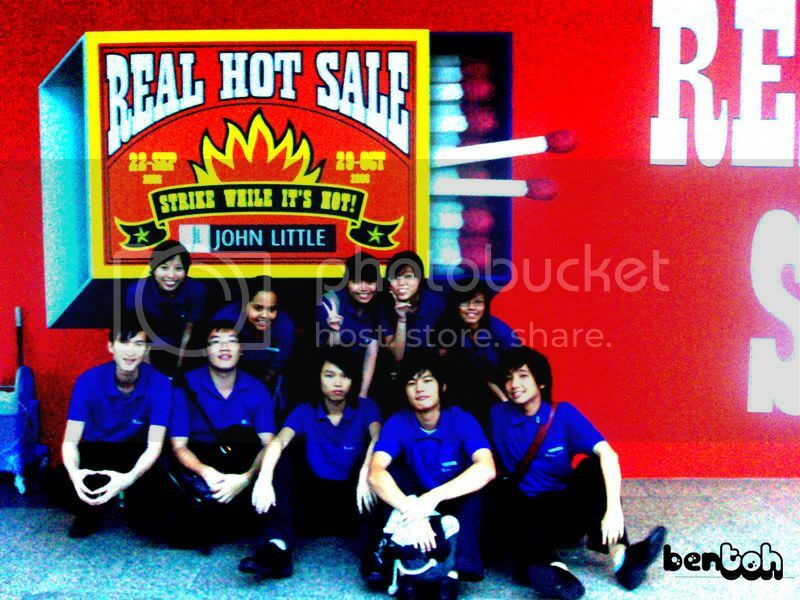 it's blur and sadly not every temp staff is in the pictures but here is it!